Remember that the month of Xber is actually October. Tip of the day readers familiar with their calendar history will know that X is the Roman number for ten and that the prefix “oct” means 8. That’s because before the calendar change of 1752, March was the first month of the year, making October the eighth month and not the tenth month. Chances are after the calendar change of 1752, Xber refers to December and that before the calendar change of 1752 it referred to October. Best advice: Record the month EXACTLY as written. If your software program doesn’t “like “Xber” then personally, I would leave the date blank and record an EXACT transcription in my notes as to the date, but that’s just my preference. And if the records being used are chronological, look at later entries in the year. It might also be good to look at earlier entries as well. We’re having a 50% off webinar sale on 4 April only. Details (including the coupon code) are in our announcement. Some people seem to always live near the border. My Trautvetter family lived near political borders in Germany, Kentucky, and Illinois. Knowing that helps my research and having printed maps is often easier than constantly using images on my computer. 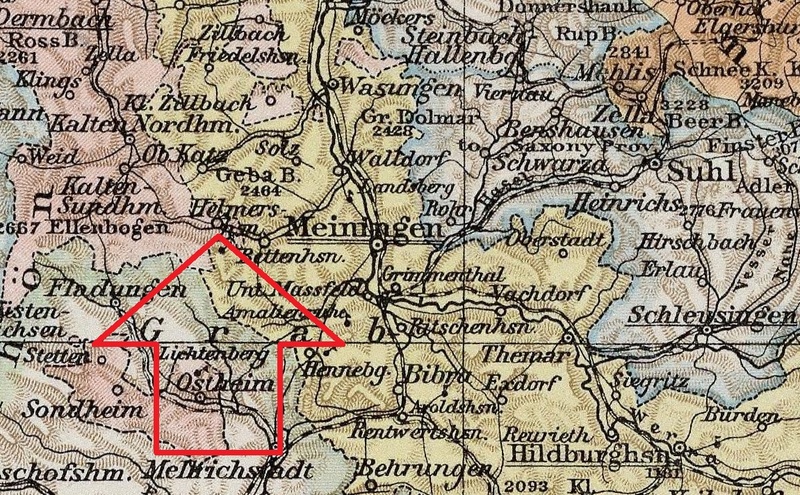 This map shows Helmershausen, Germany, clearly indicating it’s position relative to what were several Thuringian states at the time. Borders in Germany (like much of Europe) were in flux for some time. The small village was located in what was the Duchy of Saxe-Weimar-Eisenach but bordered several other Thuringen states. The town was abbreviated on the map–written as “Helmersh’sn.” I was fortunate it was not abbreviated in some other way that made it more difficult to locate. Some printed maps do not show every town. The very nearby village of Wohlmuthausen is not shown on this illustration. There’s only so much room on most printed maps. It was also apparent from the map that the village was very near the line with Bavaria. That’s good for me to know. Contemporary maps of locations are good to have, but earlier maps help us to understand the relative positions of former political entities and see the progression of boundaries over time. 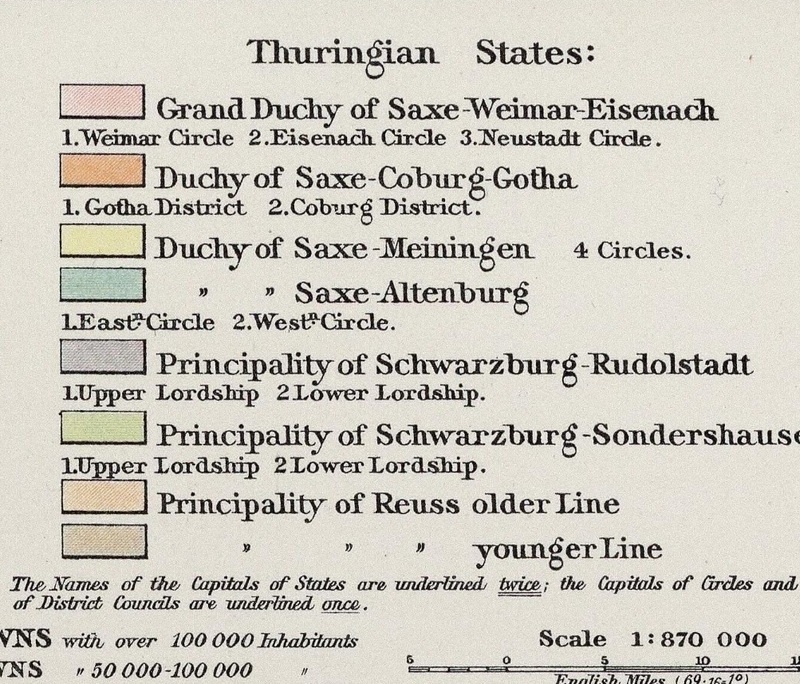 This image comes from Family Tree Historical Atlas of Germany, by James Beidler. It includes maps for all of Germany. This village was of particular interest as it is the village of Sophia Elizabeth (Derle) Trautvetter in 1808.
conclusions they reached (how you reached it and what was used to reach it). Of course permissions to use materials may be required in some cases and one should never indicate that they said or wrote something when it was actually someone else who said or wrote it. The details of citing are more specific than this, but this is a good place to start and a good set of generalities to keep in mind. And remember…the genealogy world won’t end if your citations and sources are not formatted perfectly. 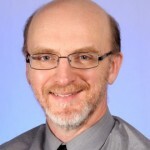 The idea is that you want to know where you got stuff–so you can track your process and improve your analysis. There’s more about genealogy standards in Genealogy Standards Manual written by the Board for Certification of Genealogists (BCG). This is the document text that is being transcribed and only the document text. This is what the document said word 4[sic] word. Discussion of the text of the document should be outside of the transcription and done in such a way that it clearly does not suggest that the discussion is a part of the document. Obvious errors in the document can be noted using a sic as was done after the “4” in the “transcription” above. Names should be spelled as written. If the spelling is consistently “wrong”, make a notation in the discussion. My personal preference is to only use sic when necessary to indicate that something was wrong originally and not a transcription error or typographical error on my part. If a probate record contains an appraisal of property and a list of what the property sold for, compare them. Are they close? Usually the values are reasonably close–unless there’s an item or two someone is “fighting over.” What can be more interesting is to see if there’s any pattern in the sale prices. In one probate from Missouri from the 1860s, the price the widow paid for items at the same was approximately 10% of the appraised value. The items that neighbors bought sold for amounts that were reasonably close the the appraised value. It didn’t take long to figure out that neighbors were probably letting her purchase items she needed. State law dictated that after certain items were given to the widow, the rest had to be sold. The estate had few bills and there wasn’t the need to raise money to pay them. The likely “unwritten agreement” between the neighbors to let the widow bid at a low price allowed the sale to take place while helping the widow preserve her property. Sometimes people find a way around things. When encountering a family of parent(s) and children, always consider the possibility that the children are not full biological siblings. Some children could have been from previous relationships either parent had and others could be theirs together. Even if there were no divorces or separations, previous spouses could have either abandoned their family or died. Left with children to support, remarriage was relatively common especially if the remaining parent’s economic status made it necessary. Never assume that what appears to be a “husband wife and their children” actually is. It may not be. The last session is about two 19th century German immigrants to Illinois, but it’s not just about Germans and it’s not just about Illinois. Barbara was married two, three, or four times–depending upon how you count and Gesche’s two daughters left no descendants but presented their own research problems. Note: One place on their website (as of this writing) indicates the seminar is in 2018–guarantee you it’s not! How does that document or entry in a register of numerous entries compare to other documents or other entries in the register? Obviously the details identifying the specific individual are different, but other aspects of the item should be similar to other documents or entries? If your document (a death certificate perhaps) is partially typed and partially handwritten are others? If different types of handwriting appear on the document are others similar? If parts of the document are left blank do others have the same blank spaces? If the item of interest is an entry in a register of baptisms, are other entries similar to yours in how they are worded, phrased, and organized? Are there other pieces of information in most of the other entries that are not included in yours. Page 22 of the second edition of the Standards Manual written by the Board for Certification of Genealogists (BCG) mentions “external consistency” as a key element in source analysis. I’ve always referred to it as looking at a document/record in context of others in the same set of records–pretty much the same thing. No record or document is created in a vacuum. Although if your research is very disorganized and tracked on small slips of paper some of those little bits of paper may end up in a vacuum, but that’s not what’s being discussed here. They do it. They find something when they aren’t expecting to and in an attempt to save it, they tuck it in a safe place out of the way quickly. The problem is that sometimes that safe place is a logical one and sometimes it is not. And because they do it, when you go through a relative’s papers you should go through everything one sheet and one page at a time. When we went through my great-aunt’s personal family papers, tucked in between two pages in the back half of a photo album was her brother’s discharge papers from the Illinois National Guard. The photo album was only half used and the discharge paper was discovered after turning from one blank page to another. There were pictures of her brother in the front of that album and it made sense to put it there. But if I had not looked through all the blank pages I would not have found it.